When Lois Carwile '45 was encouraged by her high school journalism teacher, Charles Jennings '34, to attend Occidental, a liberal arts education was not a popular choice. At the tail end of the Great Depression, unemployment remained high, and many students turned away from the liberal arts and toward city colleges and vocational schools. Lois took an interest in art history, which was taught by Professor J. Donald Young at that time. Young was an archeologist and taught about the world, something Lois hoped to achieve through journalism. Her life experiences would reaffirm her decision. After graduating from Oxy, Lois did a little bit of everything. She received training in occupational therapy before taking a plunge into theater, studying with two-time Academy Award nominee Maria Ouspenskaya. "Theater was fun," she says, but she needed a more stable career to care for her mother. She transitioned to teaching, which sent her to Germany with the Department of Defense. Later, developments at the U.S. Agency for International Development led her to teach children and future educators in Uganda. While teaching in Uganda, she developed her love for animals, particularly elephants. Once she returned to the States, Lois became an animal keeper for the Los Angeles Zoo. She took care of Billy (pictured), who was acquired by the zoo from Malaysia in 1989. He is 27, the youngest of the zoo's three elephants. As an elephant keeper, Lois fed, bathed, and (yes) picked up after her jumbo-sized pals. Although retired since 1997, Lois' excitement remains when she sees her elephant buddies-and she imitates their noises as well. 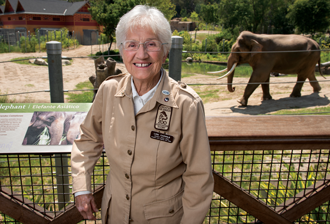 Lois has been involved with the LA Zoo in many capacities for nearly 30 years, and still leads children's tours every week. When her little tour-goers walk too slow, she says, "If I am almost 90 and I can walk this fast, then you can too!" "We love and admire Lois," says Kirin Daugharty, the zoo's volunteer manager. Lois, who lives near the Oxy campus, is a familiar face at College events and remains active with the Occidental College Women's Club. In becoming a member of the Ben Culley Society, Lois established a charitable gift annuity with Occidental, which not only provides her a guaranteed lifetime income stream, part of which is tax-free, but ensures the future of her alma mater. "Oxy gave me the chance to go to college," she says. "Why can't I do the same for others?" To learn more about the benefits of a charitable gift annuity, please contact the Office of Gift Planning.